I created Car Rental Form (Arac Kiralama Formu) about two weeks ago. Everyting was OK. But today, some fields doesn't work. 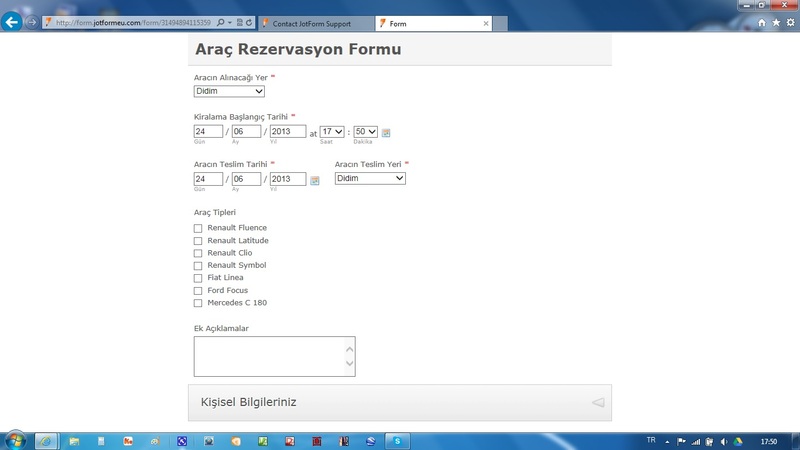 You can test that on www.ataman-group.com Rezervasyon button. I could not choose second date button. It is disable. I could not open personal (Kisisel Bilgileriniz) fileds. It is disable. Coold you help me, please ? Hi! Thanks for contacting Jotform. I was able to reproduce the issue on my end. Even when I tried to clone your form, I am experiencing the same issue. I have referred this to our developers and we'll let you know through this thread as soon as they're able to fix this. Thanks! Thank you for your urgently support. I could not find my form numbered 31494894115359 for editing. Could you help me, please ? Hi! Please open a separate thread for that and we'd be able to assist you with it. Also, since your email is not associated with any account, please create an account with Jotform so we can move that form there. Thank you. I create an account and I found it. Thank you very much for your urgently reply and solving my problem.